If you’ve ever felt as though your out of sync, swimming upstream, or just a little late to the party, and haven’t been in the habit of observing new and full moons, you might want to reconsider. 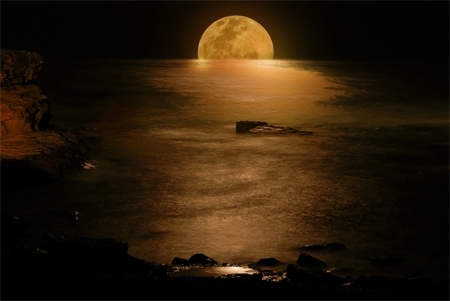 At the exact time of the new and full moon, any reverent acknowledgement – a short pause while making a heartfelt wish, a written list of meaningful intentions, simple or more elaborate rituals enacted will synchonize your life energy patterns with underlying universal patterns. In the words of Joseph Campbell, “the goal is to make your heartbeat match the heartbeat of the Universe.” That’s an energy shift with some very practical benefits. In cosmic terms, going with the flow simply makes life easier. It opens access to synchronous events giving you an edge. And because you’re aligned with cosmic force, the power of the universe is behind your intentions. It’s a different, deeper, and easier way to live. Timing is everything. One or two days prior to each new and full moon I will post a moon letter explaining the quality of the energy being released into the world, the exact time for each lunation, as well as a few suggestions for lunar intentions. You take it from there letting your intuition guide you as you experience the connection.